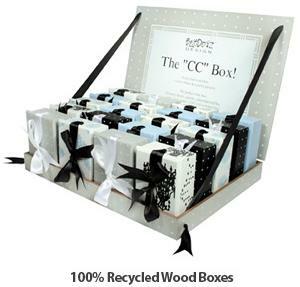 Home > Stationery > Home Office / Desk Accessories > Recycled Wood CC Box - 2 styles! Recycled Wood CC Box - 2 styles! SPECIAL PURCHASE! The BlueDogz Design CC box is an amazingly versatile size, definitely not a tiny box but not a big box either, we think it's pretty perfect! Each CC box is 3.75" x 2.5" x 1.5" and is made of recycled wood and has useful little built-in ribbons to tie its lid closed. Great packaging for a credit card sized gift card, candies, truffles, a silk scarf or jewelry. Ideal for desk organizing in style, to hold all of your small desk necessities. 8 great styles to choose from. NOTE: Limited quantities in each style; please allow us to select another substitute style for you if we don't have your original choice. SIZE DIMENSIONS: 3.75" x 2.5" x 1.5"